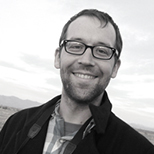 Eric Holthaus is a meteorologist who writes about weather and climate. His articles have appeared in Slate, Vice, Quartz, the Wall Street Journal, FiveThirtyEight and Rolling Stone. He lives in Tucson, Arizona.